Condition is Used. Bombshell is really nice. Shrapnel has loose arms. 1985 Bandai MR-46 Rolls Royce Go Bot L@@K!! 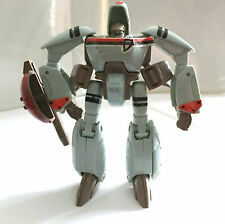 Here is a nice Bandai MR-46 Rolls Royce Go Bot This Go Bot is in nice condition I didn't know how to un fold it to get his head out but it is there. 4" as a car. Nice addition to your collection. Item has previously owned & is in VG condition, showing minor playwear & good limbs from handling. A great item to start or complete a collection with. Item has previously owned & is in VG condition, showing minor wear from handling. Only missing the weapon to complete it. A great item to start or complete a collection with. Item has previously owned & is in VG condition, showing minor wear from handling. Right gator arm is abit loose from play & complete with both laser guns. A great item to start or complete a collection with. DO NOT ASK FOR EXCEPTIONS. Item has previously owned & is in VG condition, showing minor playwear from handling. Has good limbs for its age & left tail fin has a stress mark from play. A great item to start or complete a collection with. Item has previously owned & is in VG condition, showing minor wear from handling. A great item to start or complete a collection with. Item has previously owned & is in VG condition, showing minor playwear from handling. A great item to start or complete a collection with. Item has previously owned & is in VG condition, showing minor playwear from handling. Has good limbs considering age. A great item to start or complete a collection with. This is an original from 1985. Item has previously owned & is in VG condition, showing minor wear from handling & complete with all accessories. Ladder is unbroken & intact. A great item to start or complete a collection with. Light to no wear, joints are tight, in great shape, includes sword, missile and blaster, see pics for more details. He features a pull-back motor in "vehicle" mode that propels him forward on smooth surfaces; after a short run the latch that holds his spring-loaded legs releases, causing him to flip forward and into upright "robot" mode. Vintage Go Bots Monsterous Heart Attack Figure NIP Carded Very Nice & RARE! A super rare carded Go Bots Heart Attack! This is a pretty nice one too. There is a small crease in one corner, and the card is slightly warped. However, the bubble is firmly attached and crystal clear! We are buying! TFL ID DL52. Transformers Insecticon: Bombshell - Vintage G1 1985 - New MISB AFA IT!! Mint in Sealed Box - MISB! Actual item shown in picture. It Has Never Been Opened. He collects friends the way others do energon cubes. Humans are particularly likely to fall prey to his honeyed words. Very good preowned condition. See pictures. Zabo - includes 2 weapons. I am human though and may occasionally make an error. Any errors are purely unintentional, honest mistakes. Shows very minor scuffs / paint rubs from play. This way we can RESOLVE any issues together so both parties are happy. Let us know if you need further assistance, we are always here to help! NOTES: COMPLETE. Missing the flip-up Windshield. Transforms great, nothing broken, no cracks, no plastic discoloration. Has original stickers. SCAVENGER power steam shovel. 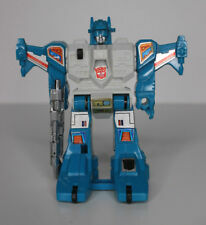 1985 Hasbro / Takara. From the 1985 Gen1 Takara line of toys. Is in good pre-owned condition, see photos. I've cleaned it to the best of my ability, but its still a little dirty in the crevices. Does not come with any weapons. Please be aware of this before purchasing. Message me if you have any questions!